On 1st October, Russian search engine Yandex announced the launch of its new web browser, Yandex.browser. Based on the Chromium open source technology (used to build Google’s Chrome among others), the cloud-based browser is very similar in look and feel to what we’ve seen before but incorporates many of Yandex’s already popular products and services, and of course its own search engine. The decision to launch a browser has undoubtedly been driven by search, and the potential advantage Google was gaining over Yandex in the Russian search space as a result of Chrome. 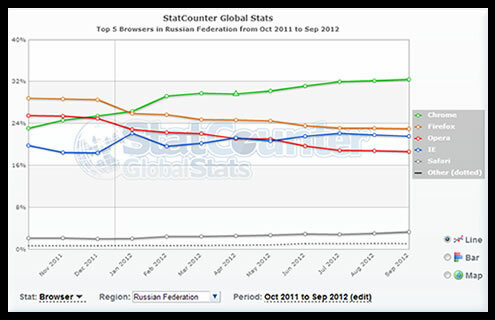 StatCounter data shows Chrome as the most popular browser in the country, with approximately 33% share and with Google as its default search engine, it’s no surprise that Google has begun, slowly, to eat away at Yandex’s majority hold on the market. And the search giant is serious about succeeding in Russia, one of the few markets where it trails a local competitor, having even run an offline marketing campaign there to promote Chrome but it is a still long way off beating Yandex, which stills holds roughly 60% share. So is Yandex copying Google or vice versa? I saw a comment last week which talked about how this development is the latest in a long line of instances where Yandex is just copying Google and releasing similar products and features. This is probably not an uncommon assumption – but it is wrong. Regarding the browser, Yandex had little choice but to react to Google’s activity and protect the position it has worked long and hard to earn. A browser was a logical step yet interestingly whilst Yandex is the default search engine, it has made it very simple for users to select a different search engine to perform a query – rather than requiring users to change settings within the browser, as is the case with Chrome. And Yandex has used the same technology as Google to build it – but hey, why reinvent the wheel? Yandex offers a web-based mail service, a range of maps services, shopping functionalities, news services –and of course search. All services and features we’ve seen from Google but the reason we’ve seen them there first might just be because we use Google and don’t use Yandex. 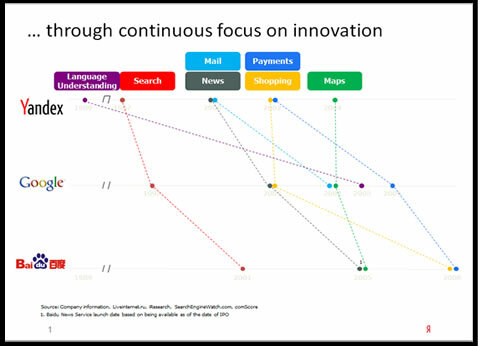 At the latest International Search Summit event in New York, Preston Carey from Yandex talked specifically about this and had a slide which helpfully illustrates the point. Yandex actually launched a year before Google, in 1997, but its team had been working on its language understanding technology from as far back as 1989. It’s this groundwork and development which gave Yandex the advantage over Google in Russia, as it had a much better understanding of how the complex Russian language needed to be dealt with for search and as a result could provide higher quality search results. It was 2005 before Google really got to grips with Russian – by which time Yandex had firmly consolidated its position. The timeline shows that some of the services made an appearance in both engines at a similar time, maps and shopping, but Yandex was first out of the blocks with news, mail and payments – all of which were developed specifically for Russian-speaking markets. Does it actually matter who copies who? However thinking of Yandex as a Google clone is a mistake for marketers targeting a Russian audience, as they could fail to understand all that Yandex has to offer and miss vital opportunities in the market. Google has improved its localised offering in Russia but it still can’t compete with the linguistic and cultural understanding of Yandex – which organisations can and should take advantage of. Looking at the strategies and development of the two search engines can offer us some useful insights. 2011 saw Yandex launch in its first non-Russian market, Turkey, but until then it had never had any kind of international focus and even with its move into international, it hasn’t taken the same route as Google and gone for the whole world in one go. It has continued to do what it does best and focus on developing products and services that will appeal to its local users – not that will match what Google is doing. Of course there is some overlap – they work in the same space and offer the same basic service, but they do it in their own ways. Don’t copy competitors for copying’s sake. Yandex doesn’t have its own browser just because Google has – it has it because it makes commercial sense for it to do so and it fits well with its other offerings. By all means, keep an eye on your competition and if they have a good idea, use it yourself. But don’t do it at the expense of your own goals, visions and most of all your customers. Performance Marketing – The Value and Perception Debate! “2011 saw Yandex launch in its first non-Russian market, Turkey.” Well, apart from yandex.ua in 2005. Or yandex.com in 2010. But hey, who is counting? Ok, that should really have been non-Russian/Cyrillic market. It has been in Belarus/Ukraine for some time but the languages/cultures are similar enough that Yandex has been able to operate there fairly seamlessly. And yes, it has Yandex.com but that isn’t targeted at any specific country. I’d still maintain that Turkey is its first serious attempt at moving internationally and out of its comfort zone.